He has never had any fitness regime. He says he has had more ailments and has been on medication for the last 3 years. As a result of the medications his body weakened and could not fight back. He has also been subject to constant back pains. Above all this he has a sedentary work life. All day long he sits at his desk and his weight had started going up. He never cultivated any good habits nor was he aware of any. There were zero activity levels. Bottom line- he had constant health issues. But, last 5 months there has been a drastic change within Anthony Soares who has started walking the path of fitness and is more positive about life. He has managed to get his health back on track—one step at a time. Let’s hear it from him what changed him. I will soon turn 40 and I realised that I needed to get over a lot of issues. I need to physically be able to lead a better and healthy life in the future. I have constantly been subject to some medical issues and been on regular medication. I was also on the heavier side and was unhappy about myself overall. I was looking for something that could help me get my basic health in place. I knew of fitness bands that help measure everything and lets you adjust your habits to get the results you want. I started researching for the same and I was convinced to go for the MI band but unfortunately, it was out of stock. And then I stumbled upon GOQii which was slightly higher in price. I remembered a friend wearing GOQii band and I asked her for more information it. Once I understood how it works and that it came with a coach who can help you make the changes, I was convinced to go for it. At the point when I took the band, I realised it is a good replacement for my watch. I started with a 3 months plan. I had no goals clear in my head to achieve. I was expecting some miracle to happen with GOQii. My coach Tarun Arora then explained how I will need to change my habits and work hard to achieve my goals. She explained everything in detail to me and what I needed to do. I started with running and interval training. 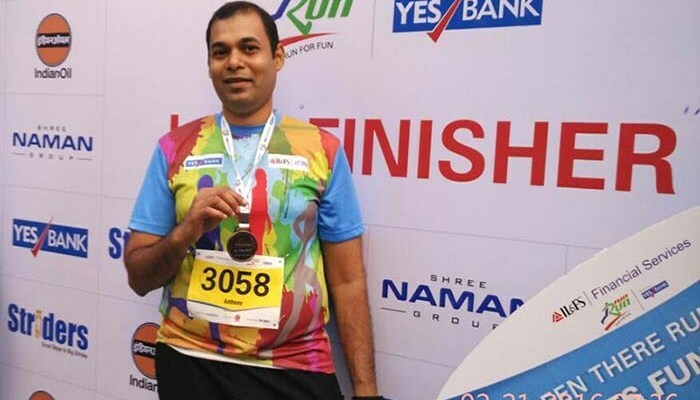 Within a month of starting to run I participated in the 5 km ILFS run and hurt my knee badly.The moment I hurt myself, my coach and the doctor advised me not to run for at least a month until the pain completely vanishes. I was not very happy initially but, I realised if I followed their advice I would only get better. Initially, when I got the band I was clueless about having any goals then I realised it was important to have a goal. My goal was to lose weight. Initially, I thought I should lose about 3-4 kilos. I have always been above 90 roughly plateauing around 94 kilos. In the last two decades, I have been maintaining my weight between 90-94. 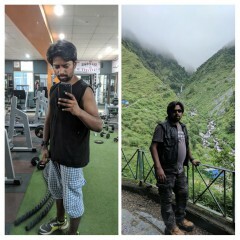 After I came on GOQii, I have lost weight purely through right nutrition and exercise. I now weigh 87 kilos within a span of 4 months. I was last at 87 kilos when I got married 9 and a half years ago. So, I can now proudly say that I am back to my old self- looking good. I can tell the difference in myself the moment I started doing more activities. I feel so much more energetic in the morning and I am also mentally more focussed and strong all day long. The other habit changes that I brought about within me is to drink 2 litres of water daily and do some interval training. This was then improvised by adding proteins to my breakfast and fruits as an evening snack. Then I was introduced to having dates before my run. When I was away from running for a while due to the knee injury, my coach gave me other exercises to do. I also started on having 1 teaspoon apple cider every day. I am a foodie and it is really difficult to break old habits. But, a lot of what I do now I am aware of it. I have also realised that anything in excess is very bad. Moderation is key I was told by my coach. I have reduced my intake on butter and cheese. At one point I used to have these so often but, now I have it occasionally. I eat mindfully when I got to a restaurant. From doing nothing at all, I now try to work out all 7 days of the week. If that is not possible then 5 days a week is for sure. My workout includes 3 times cardio and twice a week yoga. I also give my body enough rest. You cannot play around with your body. You have to give it 7 hours sleep daily and have to give it enough nutrition and water. 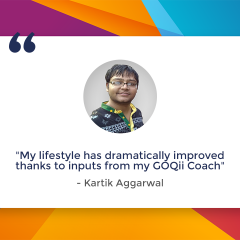 Being on the GOQii platform I have learnt to train myself to do various things. There is no magic pill that is being given to you. You have to work hard. The first thing I learnt to do is listen to myself and understand my own body. I do not force myself to do anything. If I cannot run one day that day I try and do Yoga instead. I am learning. People around me especially my family was very surprised at the change I took to. Initially, my family was not very comfortable. They wondered was is this GOQii? They were not very positive about what I was doing and the changes I was making or had made. They were surprised that I had started eating fruits because prior to GOQii we never had fruits regularly. But, now over a period they have gotten used to my habits and do not say anything now. They have noticed that I have reduced considerably but, they do not ask how why etc etc…However, they are not too convinced with the changes I have made. What matters to me is how I feel? Honestly, over the last 5 months, I feel much healthier and positive. I look better, my shoulders are not drooping. The best part now is I have the strength to lift my 4-year-old son when we go to the market and I do not stress about it like I did earlier. I am glad that things that I was not able to do or were not doing earlier I am doing them now. Thanks to GOQii, I have become very active in life. Apart from running, I have now joined for a Salsa class. I am also planning to start playing a sport. Close to 20 years of my life all I did was just study and then work. Now, at 40 I want to live my life. We live it once, whatever time has gone is gone. But, not anymore. I am glad that I have started on a couple of activities. What does coachTarun Arora have to say about Anthony? Anthony is sincere, disciplined and a hardworking person who understands the importance of health. 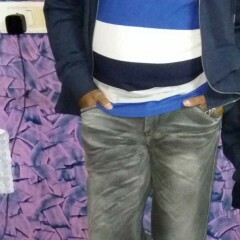 He is always ready to make healthy changes in life once he is convinced of it and then gives his 100% to achieve them. 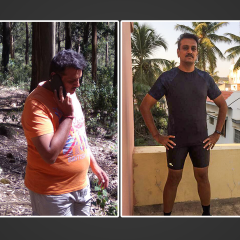 There were few visible things which needed to be changed in his routine like a correct combination of meals, an increase in protein intake which was lacking in every meal and water intake.We started with one habit at a time. The first habit was to increase water intake to 2 litres because his water intake was quite less, we have developed a habit of having 2 litres everyday. This has made a huge difference in his hunger pangs.We then moved to make sure his protein intake is sufficient enough to help him reach his goal of getting a toned body and along with this proper intake of fiber.